Despite a sparkling start from Chase Farrell, the Pippins offense couldn’t back him up as the Pippins saw their postseason hopes dashed in a 2-0 loss to the Knights on Tuesday. Farrell and Knights starter Connor Redmond were dueling early, matching zeros in the first and second innings. With two outs in the third, Corvallis went to Aaron Shoup out of the bullpen. Victor Cerny and Elijah Greene hit back to back singles before Shoup got out of the inning. Farrell continued to dominate early and with some help from a caught stealing and a double play, faced the minimum through the first four innings. In the fifth, Cody Hawken hit a two out double but was stranded at second. 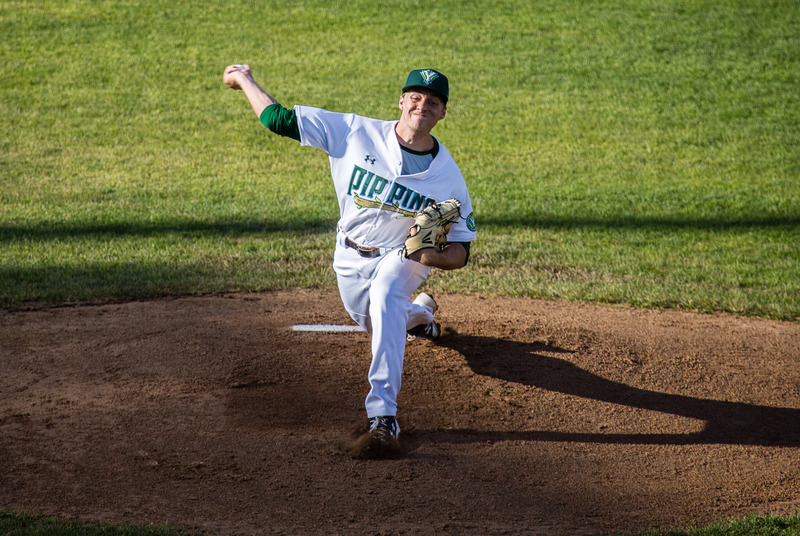 The Pippins offense continued to struggle against the Corvallis bullpen. In the fourth, Jake Moberg and Nick DiCarlo reached base with two outs but on a wild pitch, DiCarlo was caught trying to take second. In the sixth, the Pippins had runners at first and second with two outs but Kyle Dean was picked off at first by catcher Zak Taylor after taking too big of a secondary lead. The game was scoreless until the bottom of the seventh when Austin Feist didn’t miss a rare mistake from Farrell and launched a solo home run over the left field wall. Farrell came back out for the bottom of the eighth but was pulled after a leadoff single. Connor White came in and two batters later Cole Hamilton drove in a big insurance run with a single. The Pippins put together one final rally in the top of the ninth, putting runners at first and second with two outs but Cam Campbell lined out to second to end the game. With the loss, the Pippins postseason hopes were ended. They have one final game to end the 2018 season on Wednesday against the Knights. First pitch at 7:05.